My uncle moved into the memory care unit at Silvergate San Marcos. Its set up in clusters so each bedroom opens right into the living and dining space, so there's not a whole lot of walking. They offer activities like singing, music, and road trips. They offer three meals a day and snacks. They do the laundry. The caregivers could be a little bit more personable and involved. We loved Silvergate San Marcos. It seemed like they were very caring. It was clean, and I liked the staff. It was a very good location and affordable. Glad to hear it! Thank you for visiting and we are happy you are moving forward with Silvergate! Silvergate San Marcos was a beautiful place. The rooms were nicer than the other rooms we had seen. The low end of the price was within our range, but when we got in there, we learned that they had a lot of added expenses like in medication, and everything was an add on. The facility looked very nice, but it was out of our price range. It looked more like a hotel. Everything was very good at Silvergate, and I was happy with it. However, it was too expensive. I met with the marketing person, and she was very nice. I thought they had a good range of activities. The location was convenient. I like Silvergate San Marcos because they are like in a village system. The bedrooms open to a center living room rather than residents walking down the long narrow hallway, which I think would scare Alzheimer's people. This seems more like a home environment. They offer someone there 24 hours, and a nurse is always on duty at night, which is important to me. They are very caring. They organized a piano recital, and it was interesting to watch the nurses work with the patients to get them to agree to go watch it. They're very patient and very caring. My brother has not yet moved in, but we're on the list. Silvergate Retirement was very nice. I had lunch with them, and I was happy with the whole operation. The rooms were like a little hotel room, but they were good enough. The food was good, and the people were nice. The one thing I did not like was the location. It was kind of hard to find. Silvergate called me right after I sent the email asking for assistance. My mother is doing well, and she really likes it there. It was small, privately owned, and affordable. It wasn’t flashy, and it’s just 12 minutes from where I live. Silvergate had really good pricing, but they were definitely the oldest facility I've seen. Unfortunately for me, the location did not feel very secure in that area. It looked like an apartment complex. The rooms were on the small size. Their shower was basically an old plastic tub, but they cut down the side so you could step in. It was like four or five inches off the ground, which my mother-in-law could not step up onto at all. Silvergate Retirement is just not as nice as others. They had several dining areas that were just OK. There's nothing wrong with them, but they're just not as nice. Silvergate had wide, open spaces for people to wander, especially in memory care. The assisted living is separate from memory care, and that’s great. Everything was great. Their rooms were great and spacious. The memory care rooms were shared rooms, which is fine, with a divider at the middle that makes a huge difference. The head nurse of the caregivers really tried to partner up the roommates with someone on the same level of memory care needs. The assisted living facility has small kitchenettes so to speak, and balconies. They had a big laundry room and the services that you wanted. I have been to Silvergate and liked everything about it except the location. I thought the rooms were very nice, not as modern as some of the others, but very adequate. They didn't have a view. They just looked out on another building and that was disturbing to me. I don't want to live like that. There were very little grounds. There's an extremely small center courtyard, but you just come out the door and you're on the road. Beyond the building, it was just parking lots and other buildings. I liked everything else about it. The people working there seemed to be very caring and gave a really good impression. We looked at Silvergate San Marcos. I’m looking for a smaller place for my mother, and Silvergate was perfect. We had a room and everything, so I brought her down, but she said, “That’s nice but I’m not moving.“ The staff was very nice. I think the marketing manager showed us around; it was very nice. The rooms are very nice. The living room area has a shower and a toilet, and a bedroom has a shower and a toilet. We like the one that has a little patio and my mom likes that because she wants to sit outside. It was very nice, and it was what we were looking for. They have bridge, they have discussion groups, and they are doing exercise with a group. I like the community because it is small, it is very clean, and everybody knows each other. Silvergate San Marcos was out toward the desert -- not all that far out but far enough. I have to give a low score for location. The rooms were adequate. The staff was very helpful, and the dining area was neat. We visited Silvergate, and it looked fine. The rooms were fine, but it's a little older facility. Thanks for touring with us. We recognize the age of our quaint community but are always investing back into the building. Be sure to ask about recent renovations and capital improvements! Silvergate Retirement Residence seems fine. They were certainly very easy to work with. I like the layout that they have which is kind of individual. It makes it smaller and makes it quieter. I didn't choose them because I just didn't get a good feel for the care workers. They seemed nice, and I liked the cost. I think the cost is really nice. I can't tell why; there is just something about the staff that I didn't get a good enough feeling about. They are pretty good. They are just not quite right for me. Our layout is very unique in this industry. It's unfortunate this reviewer did not get a good feel about our care workers. We have a very low turn over rate here at Silvergate due to the local ownership that holds on to great employees. It's all about the right fit and we hope this reviewer found what they were looking for. I like Silvergate San Marcos very much. I have been going over there for quite a while with several people from my village. It is a very clean and very friendly community. Everybody there is very friendly. They make you feel welcome. They have all kinds of activities and we were even invited to attend some of them. Just recently, we went to their luau party and I had fun there. We were also invited to some of their trips. I've also tried eating there and food is good. My family toured Silvergate as part of the process of seeking an assisted living facility for my grandmother. I had called in advance to make an appointment for a tour, and was told to come in anytime. When I arrived, there was no one at the front desk. I waited for ten minutes, and then followed some people to a recreation room, where some residents and staff were apparently throwing a birthday party for one of the residents. The staff member asked if I could wait for another five minutes. I agreed, because I thought it was nice that they were celebrating a resident's birthday. While I was waiting, a very elderly man came to the office looking for assistance; he didn't seem to understand that the staff were in the next room. He returned to his room. I informed the staff member that this happened, but she did not seem very concerned. When we toured the facility, it seemed okay, but not excellent. The rooms and apartments were nice, although very small. My grandmother was very concerned about space. The staff member discussed their Alzheimer's program at length, which was impressive. The dining facilities were average. Overall, I felt that Silvergate had an excellent Alzheimer's program, but was less focused on non-dementia patients. In the end, we chose a different facility. Silvergate San Marcos has really wonderful staff, and my visit was great. I like that the place is a little smaller and not too big. It's well-maintained and everyone was super friendly. The 1-bedroom that we were interested in was really great, and it was the biggest one we saw, which is wonderful. The person who showed us around was amazing. It was the best tour we've had. They have the standard activities, someone would come in to exercise, watch movies, there are beauty salon appointments, and they take the residents out shopping and so on. They provide three meals a day, and they have an anytime dining type of thing. So if you want to go with a traditional lunch or dinner they have a menu that you can order off any time of the day. We just moved mom into Silvergate San Marcos. It's a good place. It's small with 92 people instead of over 100, so that's nice. It's in a really nice location compared to some of the others. The other Silvergate was remote and far away from a lot of the activities, doctors' offices, and shopping. This place is smaller and it just seemed closer to what she was looking for. It's very family oriented, which means the people there kind of adopt each other. They take care of each other, they watch out for each other, and they play with each other. It's just a real close community. She is upstairs in a unit that is far from the elevator and there's only one elevator. She has to walk a long way to get to the elevator and at 92 that's a little tough, but she's doing it. She's on a list to move into a unit downstairs that's closer to everything. The staff is wonderful. The food is absolutely delicious, and even though it's plenty of food, there are only two choices. There's something going on all day every day. It's just a little expensive. Silvergate San Marcos was OK, but we weren't that impressed with it. It was definitely not on the top of our list. It seemed like an older facility. They didn't really have the amenities that some of the others have and the location wasn't terrific. It didn't appeal to us. We are an older facility but you have to come and see the newly remodeled lobby, courtyard, movie theatre just to name a few things. Sorry we weren't the best location for them. Others love just how close we are to local shopping - right across the street! Silvergate San Marcos was very nice and the staff was also nice. They had activities like parties. They had a theater, a library, a dining room, a laundry room, and an outdoor patio. We found Silvergate in San Marcos. I like the way it is run and I like the fact that it is not like a national organization. There are only two or three facilities and the owner is hands-on. They have activities my mom wanted. It is better for independent living than some of the others even though it has the option where you do need more care. It is really good for my mom. As per my mom’s conversation, she said the food is not as good as her old place, but it is getting better. She thinks the people at Silvergate are much friendlier, too. Describe the overall population of assisted living residents at Silvergate San Marcos. What is their average age? What are their favorite things to do? We have roughly 75 resident's, some of which are receiving help in the assisted living. Average age is early 80's. We remain a smaller boutique like alternative to all the other larger, corporate run communities with hundreds of residents in their buildings. What programs or activities does Silvergate San Marcos offer to enrich residents' well-being? What places are near Silvergate San Marcos or within walking distance for assisted living residents to enjoy? We are located right behind a Vons shopping center that our residents walk right to through a breeze way. Our residents also go to the banking and other small shops right there. We are not isolated away from this convenience like other retirement communities. What transportation services does Silvergate San Marcos offer to assisted living residents? Local Doctor appointments and local banking and shopping is typically included. What makes the chef or dining program at Silvergate San Marcos exceptional? What kind of menu can assisted living residents expect? Less residents equals higher quality of food. We offer all day dining with daily specials to chose from. Describe the neighborhood around Silvergate San Marcos. Is it located in a residential neighborhood, a business district, a rural setting, or other type of locale? Combination of residential and business. Is Silvergate San Marcos affiliated with a hospital if more care is needed? Our residents when needed visit either Palomar Hospital, Scripps Green in Encinitas, or Tri City. 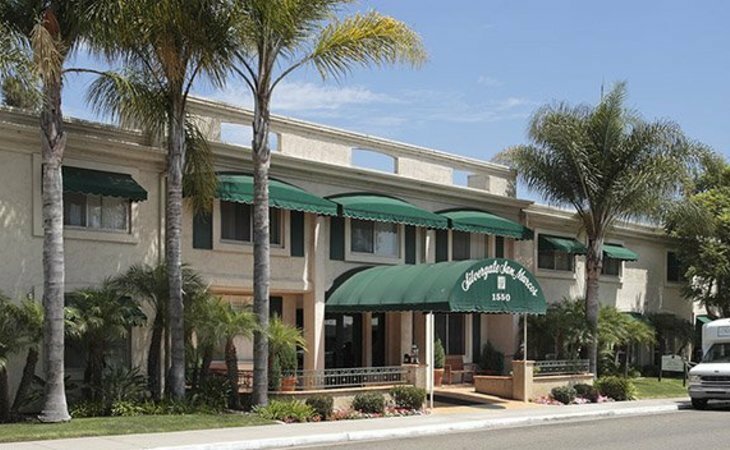 For more than 20 years, Silvergate Retirement Residence has been providing premier independent, assisted living, and memory care to the North San Diego County. Located near the beautiful Lake San Marcos, our community is conveniently near popular restaurants, shopping centers, and theaters. Silvergate is locally owned and operated by AmeriCare Health & Retirement, Inc. and has been recognized as one of San Diego's BEST Retirement Communities by The Union Tribune's annual Readers Poll. For residents living with Alzheimer's or related dementia, Silvergate's Memory Care Suites are designed to feel like home, but offer the safety of a secured perimeter, high-level supervision, and around-the-clock security. The monthly rate includes: private or semi-private accommodations, licensed nursed available daily, daily meals and snacks, staff trained in memory impairment, 24-hour monitoring and supervision, regular reminders and redirection, specialized programs and activities, daily housekeeping services, and secure outside grounds. Silvergate is locally owned and operated by AmeriCare Health & Retirement, Inc. and has been recognized as one of San Diego's BEST Retirement Communities by The Union Tribune's annual Readers Poll. What should caregivers and potential residents know about Silvergate San Marcos?